I read somewhere that you sound never say sorry to your blog readers for not posting as often as you should. I really think I should explain myself for my lack of consist postings. Maybe because I am about to shoot the weather for changing on me so rapidly. One day a lovely warm spring day, next I am about to freeze my limbs off from the cold cold breeze. This does not help me to sleep, which as you guys know is almost nocturnal. In addition, over the past two weeks I think I have done more custom cake orders than I have done for the first half of the year. Not to mention I am about embark on my first dessert table! Yep my sister is currently with child (very heavily with child, she is only tiny, 5 foot 2). So at her request have done cookies and cakes for her shower. If you follow me on instagram you can see the cookie we done last night. Big honey sugar cookies in the shape of elephants. For some reason she has want elephants as the theme to her shower but each to their own I guess. Lots of tears have come about with this project, but I am sure I might learn something from it (finger crossed). Yes I have cried over fondant and cake… Judge as you will. Excuses, excuses, excuses I hear you say. For those who might sympathise with me thank you and continue reading because I have food hack that should be done by anyone who needs sugar comfort. I present to you Granola cookie crumbled pancakes with runny date blueberry syrup. Try getting your head around that one in the morning! 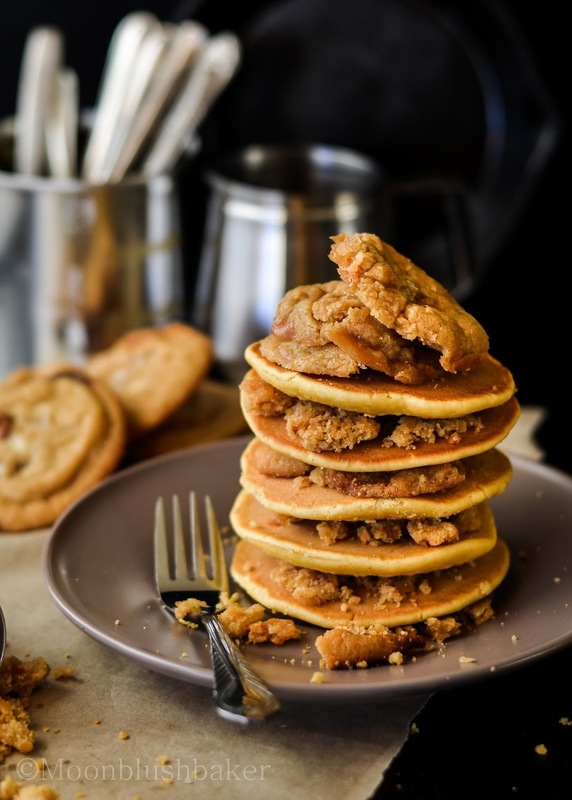 Cookies, syrup and pancakes. Check list for a great start to any day. 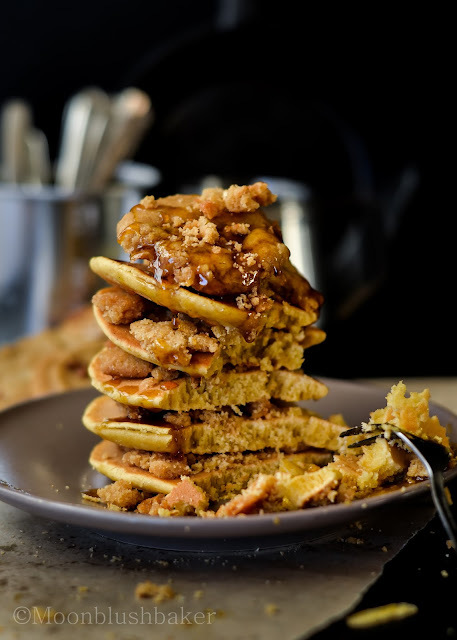 I love breakfast food for any time of the day and this recipe can be adapted to be as sweet or trashy as you like. 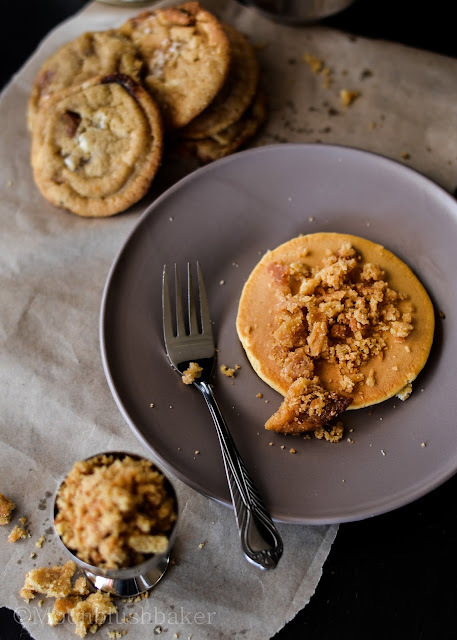 The virtue of this recipe is that a majority of ingredient used come from sources of natural sugar and whole grains, so it is not as dessert like the title makes it out to be. I have recent found a brand of oatmeal cookies in Australia that uses processed oatmeal as the base. This means the texture is not rough but chewy and soft set like the one made with normal flour. Of course you can use any cookie you fancy at the moment, but right now these Granola chew cookies are my choice. I do not have copy- cat recipe of the cookie to give you (working on it!) 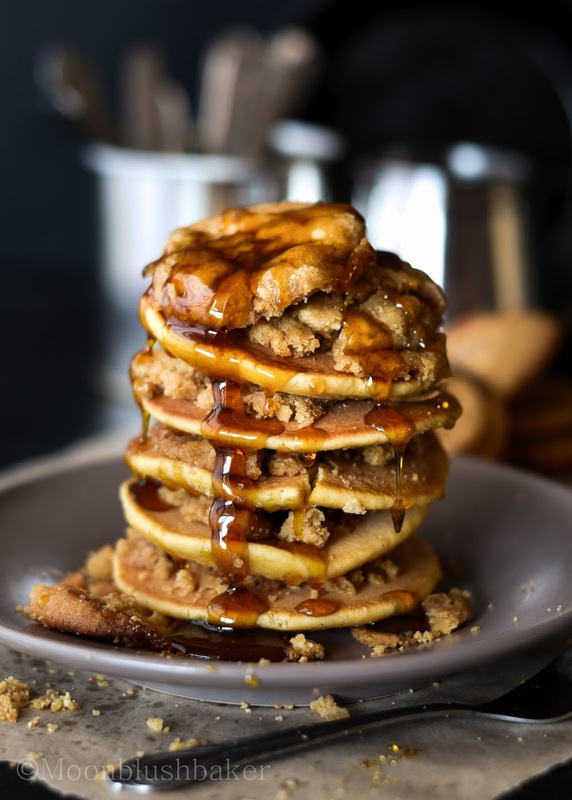 but I think you could get away with using your favourite cookie in this recipe or if you want to go the whole meal route; I recommend trying an Australian classic the ANZAC in this pancake stack. When under baked ANZACS are notoriously chewy with a crispy edge, so great sub here. Date syrup is something you can home make and is 100 times better than store bought. For a twist I also soaked a few blueberries in the mix. Wonderful tart flavour comes from the blueberries which I like. Feel free to leave this out but! So I am sorry or having almost nothing to talk about in this post but I think this pancake hack will leave you very happy. 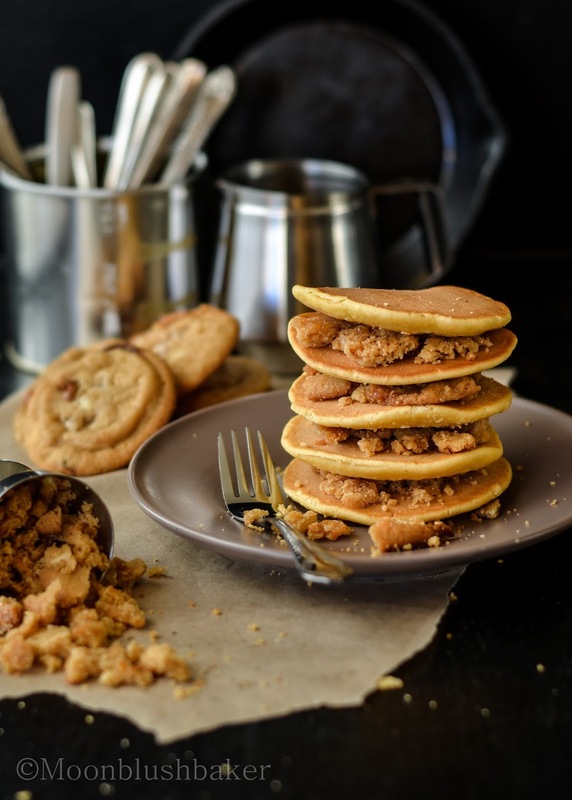 100g Crumble up granola cookies, ANZACS or your favourite whole grain biscuit. In a bowl combined your flour, baking powder, salt and bi carb. Make a well in the middle of the flour bowl and pour your milk mix in. Working from the inside out, bring in the flour with with a whisk until combined. After pour in butter and mix. Fold in your eggs until combined. Place to rest on the counter for one hour. After one hour pre heat a non stick skillet to medium low. In large pot place your dried fruit and water. Bring to boil then turn it to summer for 30 minutes. Allow to cool. Once cooled process it until it is a smooth as possible. Strain it though a fine sieve but do not press! 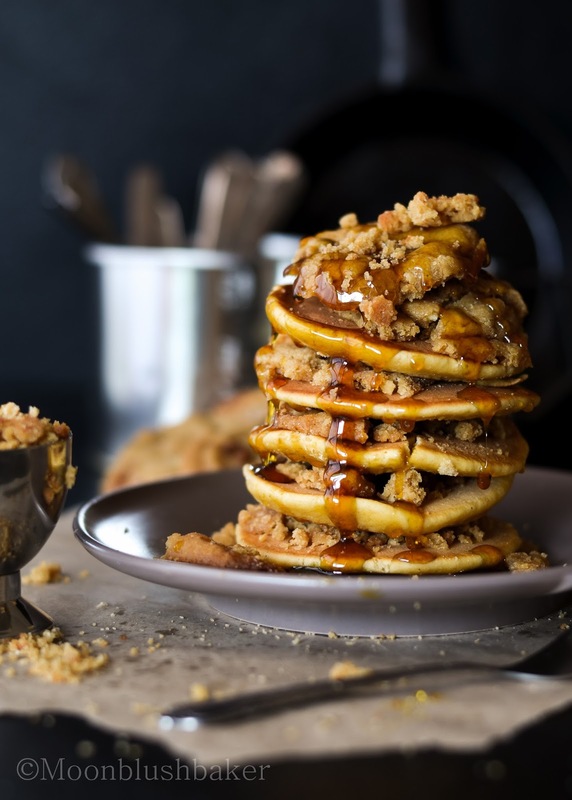 Place one pancake down then crumble one tablespoon of cookie crumb on to that pancake. Continue this until you get a stack. Top with a final whole cookie and drizzle over syrup. Beautiful photos! I love the first one- makes my mouth water! Thank you Rachel, it is always wonderful to hear feed back. Oh my, I want these so bad! Pamela, it is so easy! and because it is small batch recipe you can have them anytime. I hope you try it. 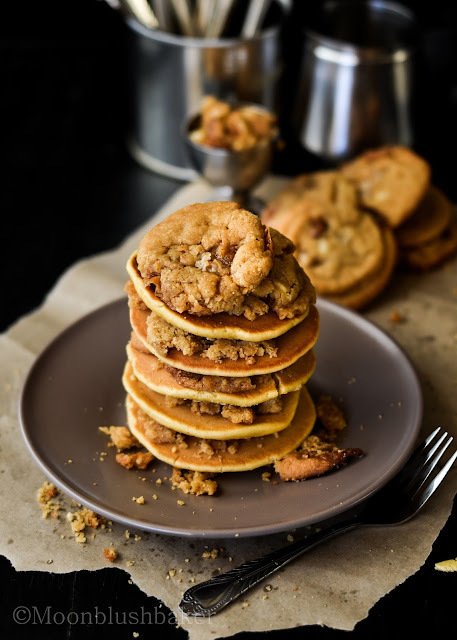 What a sneaky way to add cookies to breakfast!! I didn’t grow up eating pancakes so… is there a secret that everyone knows but me, on how to turn out identical-sized pancakes every time? Anyway to get more dessert into the day, I am going to try it. I honestly just pour the batter one go to get my pancakes. Nice and quicky. Some times they come out nice but majority of the time they are wonky too. How gorgeous is that stack?! Love the crumbled cookie idea! You are too kind! cookies make everything better do not they? Im in love with every ingredient/element!! Date blue berry syrup = omg I want that on everything. Maybe just with a spoon. And graham/ginger/molasses cookies one of my fave flavor profiles. Heavenly on a stack of pancakes! Wow…so creative! Pinnned! Yep Averie, Cookies and breakfast can be marriage made in heaven.I am trying to get that biscuit just right before I post it but I am almost there! I hope you give it go with one your amazing cookie recipes! 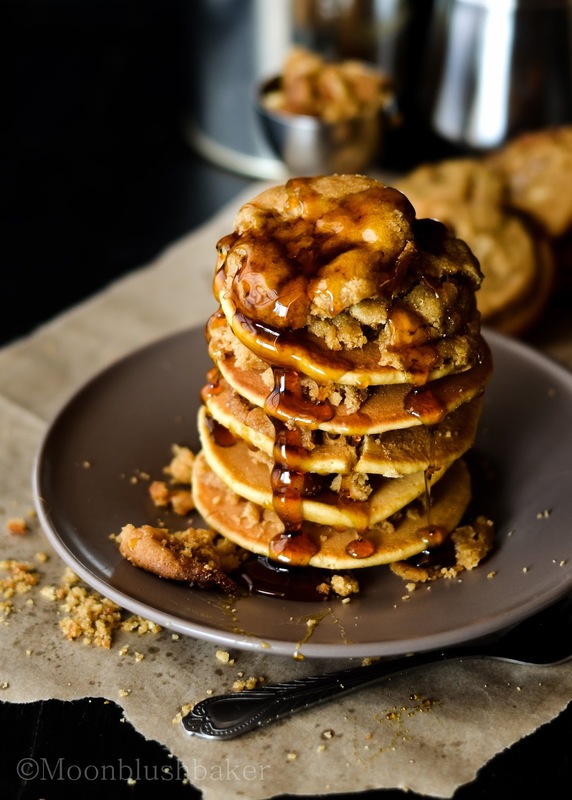 That stack of pancakes and cookies and syrup looks unreal! I also love anzac cookies! Oh my heavenly heavens. Your photography is phenomenal. And the pancakes look delicious! Beautiful. Aww this Comment made my day! Thank you such warming comments about my food and photos. Are you kidding me with these?! One of the most amazing stacks I’ve ever seen! Wow, just wow. Your words are too Kind todd. I am a girlwho like to eat cookies for breakfast or any time for that matter. yummy, that looks delicious…..Thanks for sharing this recipe….